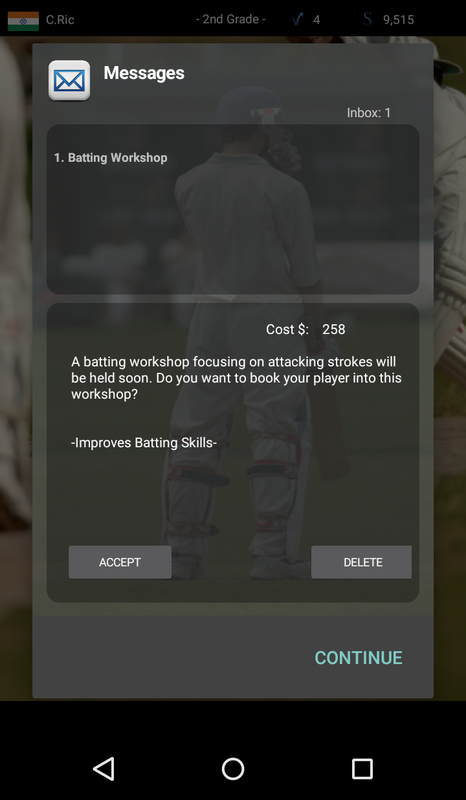 Cricket Player Manager is a management game for Android developed by Blockhole Games. This game is one of it’s own kind and is not similar to other management games. 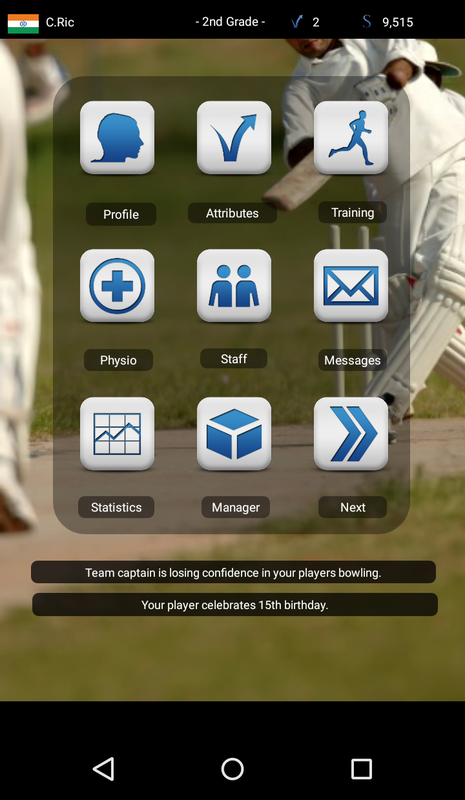 Cricket Player allows you to manage a career of a young cricket player (your own player), manage his career aspects such as personal training, health, physio etc. and help him to get selected in the national side. You can checkout the complete features of the game here. 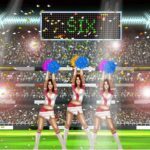 At first the game looks very promising and we have decided to write the first impressions or a quick review of it. The UI is pretty clean and responsive. Even on a low spec Android mobile or tablet, it works like charm without any lags. The UI of the game looks pretty professional and easy for a user who is playing the game for the first time. However, I was facing a control issue when there is no button for Exit and the back button of my Android phone doesn’t quits the game. I was impressed with the features like Injuries, contract system, staff hiring and statistics system. 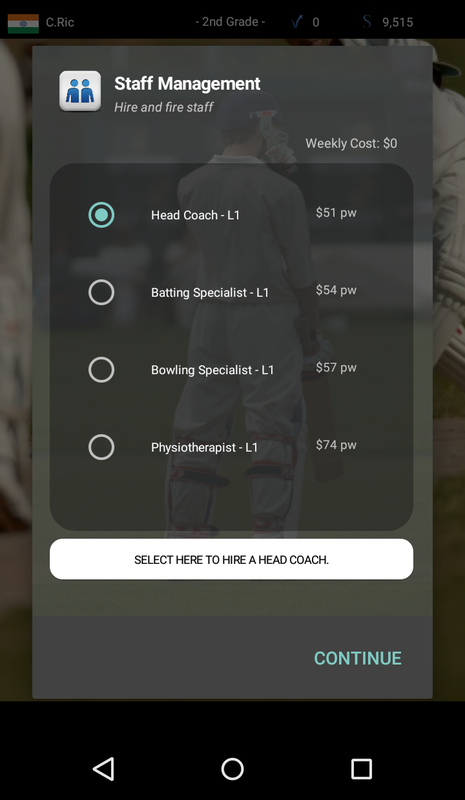 You can manage your staff such as coaches, physio, specialists or attend various workshops to improve your skills while you are playing 2nd grade cricket. After playing each match, you will get some attribute points which you can add in your skill. 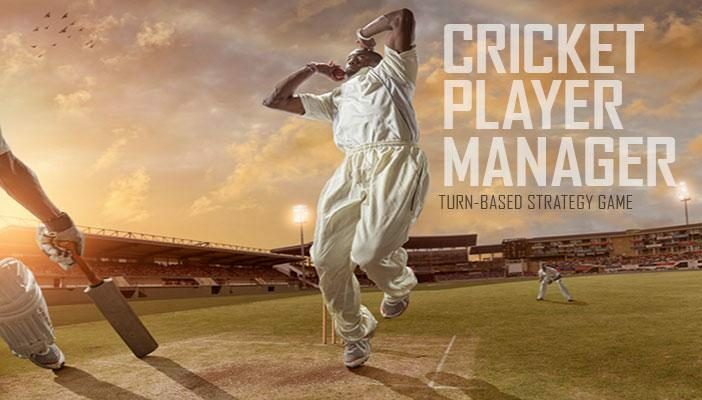 However, one thing I would like to see is creating your player as a specialist batsman or a specialist bowler. 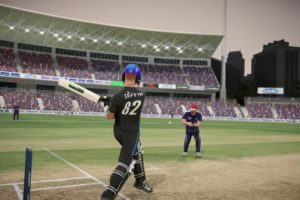 The current system only allows you to pick both the skills together and even when you play the matches, your player will perform like an all-rounder. 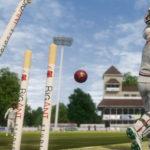 The game still lacks a T20 and Test match mode. Few more additions in the career mode can be a great advantage. 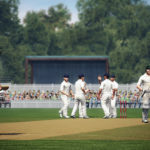 Special abilities like “excellent fielder”, “death bowler” for your player would be a great advantage if these features can be added in the next version. The company has really worked on the gameplay. The AI is pretty decent. For an example, if your player is in form he will score decent runs in consecutive matches. 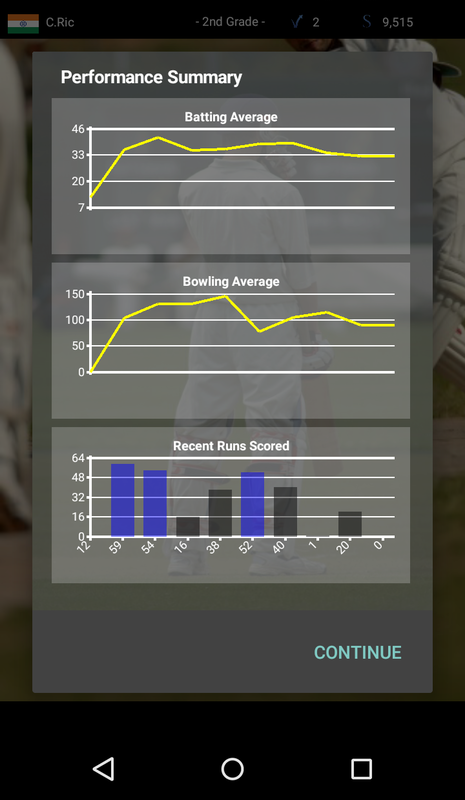 If your player’s form is degrading and he isn’t scoring runs, you can either attend a training workshop or hire specialist staff and you will see the changes in the performance of your player. His performance will start improving slowly. 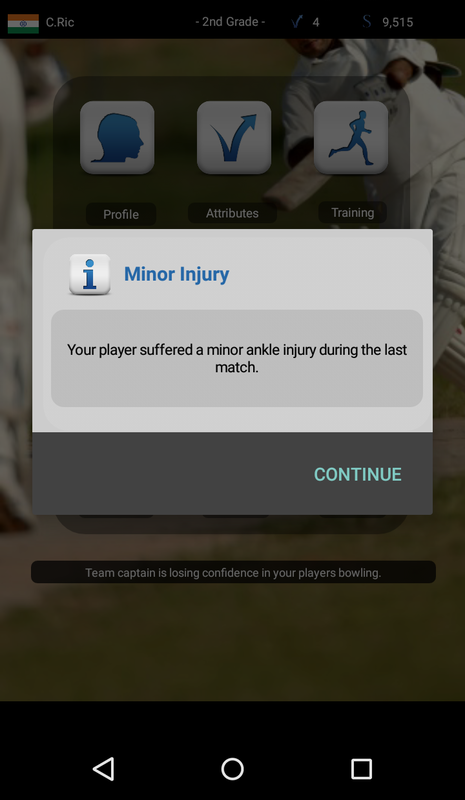 The injury system works pretty well. 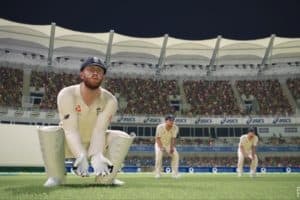 The simulation of match and your player’s performance in that match is pretty decent and not too unrealistic. But, most of the time his performance is based on his All-rounder skills i.e, he will always be an All-rounder instead of specialist batsman or bowler. This game has got a lot of potential if the developers will start working on it and adding new features. After playing few seasons you may find it a bit boring but it is still not that bad. You can upload your scores online in the leaderboard and compare it with other managers. We would love to see more features in this game but the last time this game was updated was in January 2015. 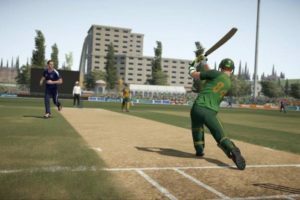 It would be interesting to see how indie developer will compete when Rockingham Software will release their Cricket Coach on Android. UPDATE: Blockhole Games just informed us on Facebook that an update for this game which includes improvements in the engine, interface with new feature additions is under development which will be released later on this year. You can follow them on their Facebook page.